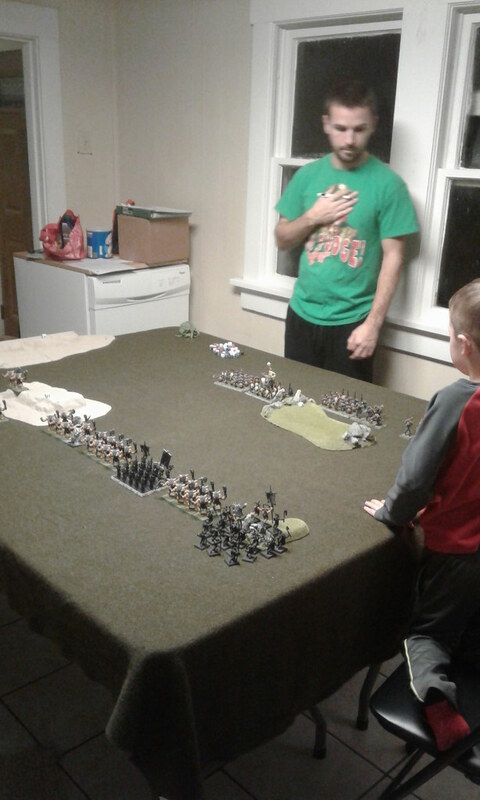 I realize I'm a little late in posting this, but my brother and I played a game Saturday night while I was at drill. 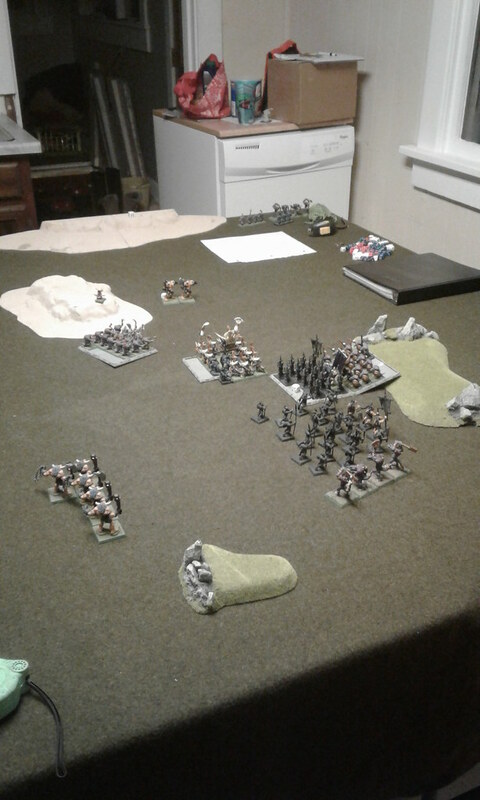 My new phone has a great camera, and I got to put it to the test, as well as my Beastmen against the Lizardmen, which is a fight we haven't manage to get around to since starting back up with Classichammer. 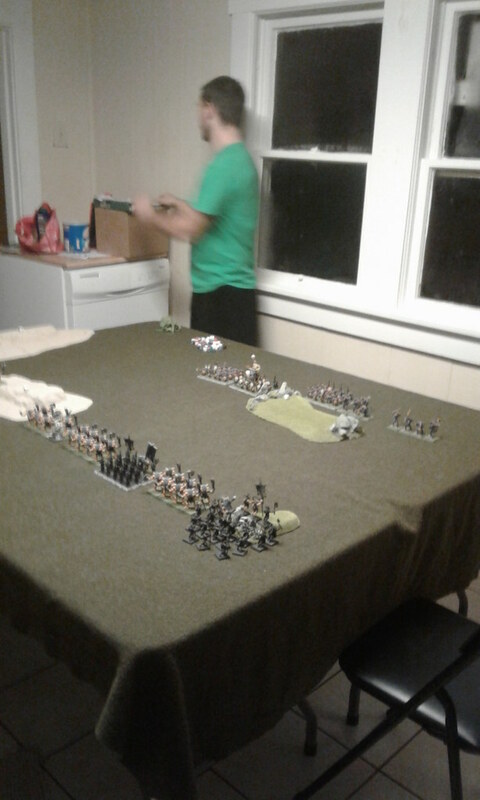 2,024 point armies approximately because I overshot and we decided to stay there. Rolled for spells, and I got Dark Hand of Death and Steal Soul. Ashley got Fireball, Dark Hand of Death, Urru's Dazzling Brightness, Rule of Burning Iron, and Flaming Head on his Slann, with Second Sign of Amul and Storm of Cronos on his Skink Priest. Ashley rolled a 6 for choice of first turn, and wisely decided to go first. 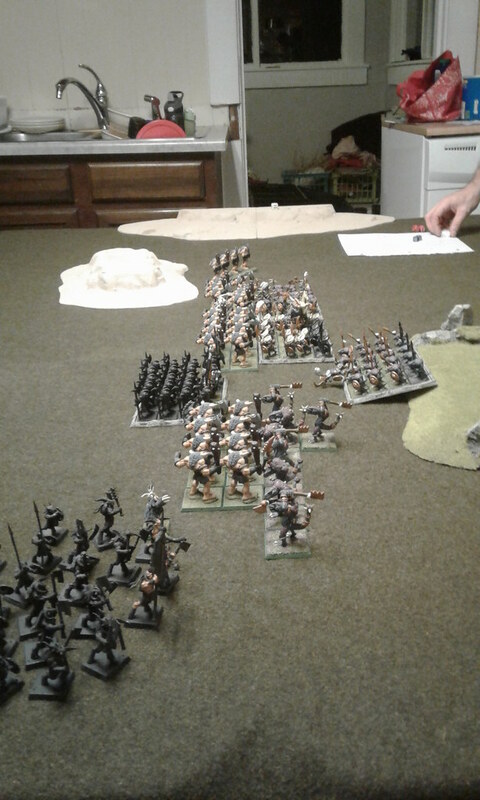 The Lizardmen moved ahead at 8", the max speed of the slowest units. In the Magic Phase the Slann cast Dark Hand of Death on the Doombull unit, but does no damage. 2 wounds, however, come from Fireball. Rule of Burning Iron is dispelled, and the Mage Priest successfully casts Drain Magic at level 2. The Skink Shaman saves 2 Power Dice in the Diadem of Power. I try my best not to be "that guy", and doing the 1" shuffle is being "that guy" to me. Every fiber of my being told me that I should hold off on moving and get the charges off in turn 2. I ignored every fiber thinking my T4 guys would hold up. The Beastmen surged forward at top speed, 12" for the Minotaurs, 10" for the other units. 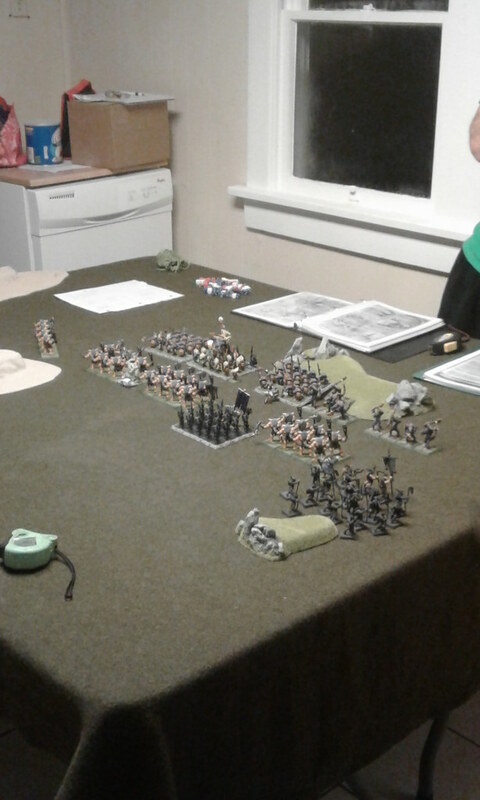 The 4 man Minotaur unit on my left side of the board wheeled so as to flank charge later. The Brayshaman failed to cast Wild Call, and the Skink Priest saved 2 new dice in the Diadem. 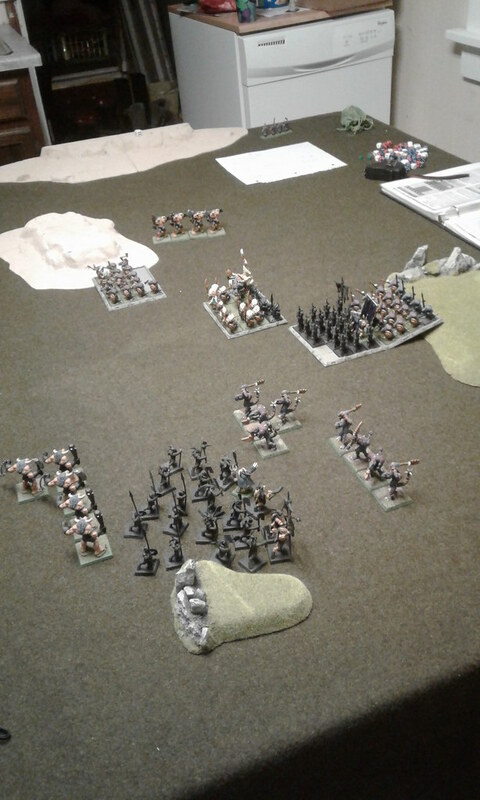 EVERY unit in the army but the Skink Shaman declares a charge, with only the Spear Saurus Warriors failing their Fear test, resulting in the Doombull unit being engaged by the Hand Weapon Saurus Warriors, the Temple Guard engaged with the middle 8 man Minotaur unit, and both Kroxigor units engaged with the last 8 man Minotaur unit. The Bestigors, Beast Herd, and small Minotaur unit remain unengaged. The Shaman moves between the 2 Minotaur units to avoid any overruns, just in case. Fireball failed to wound the Bestigors, and Dark Hand causes 3 wounds, but 1 is saved. Urru's Dazzling Brilliance reduces the Doombull's unit to WS1. Combat sees 5 wounds caused on the Doombull's unit, with 4 on the Saurus in return. The Minotaurs then break and flee 8" with the Saurus pursuing 10". The Temple Guard do 3 wounds to their Minotaur opponents, while the Minotaurs fail to wound. A failed rerollable break test sees the Minotaurs fleeing 3", and the Temple Guard pursuing 4". The Kroxigors do a combined total of 9 wounds on their Minotaur unit, and the Minotaurs defiantly do 1 wound back in return. Breaking and fleeing, the Minotaurs run 8" as the cumbersome Kroxigor units pursue 7" and 5". The resulting panic checks see the Beast Herd fleeing 6". At this point I pretty much realize the game is over, but I am no quitter, and I had faith that the random nature of the dice rolls might yet work out for me. 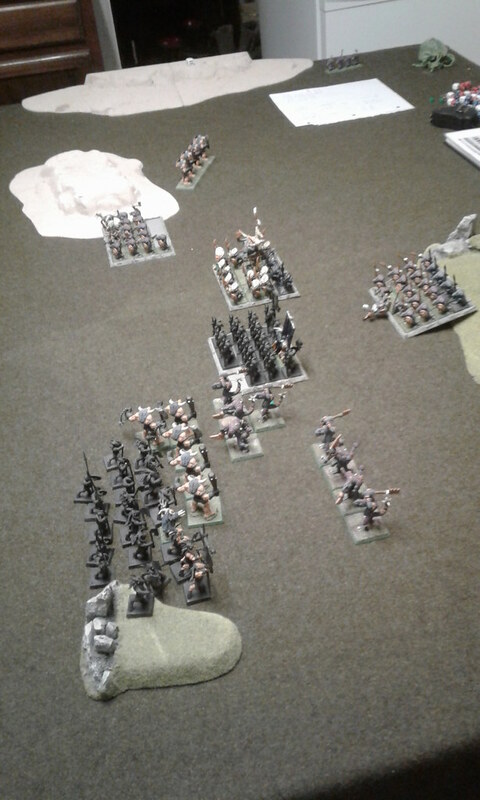 The Bestigors declare a charge against the Spear Saurus, and they hold. The Herd rallies, but the fleeing Minotaurs flee an additional 8". The last Minotaur unit wheels to get around to the battle line. The Brayshaman casts Wild Call with Irresistible Force, resulting in the Herd charging the closest Kroxigor unit. In the first combat, the Bestigors kill 2 Spear Saurus, while the Saurus kill 2 Bestigors in return. The Spears pass their break test on 3 1's discarding the highest, of course. The Beast Herd kills the Champion of the Kroxigors by doing 3 wounds, with 1 wound being done on another Kroxigor. 1 wound is done to the Brayshaman, but the Kroxies still lose combat easily passing their Break test. 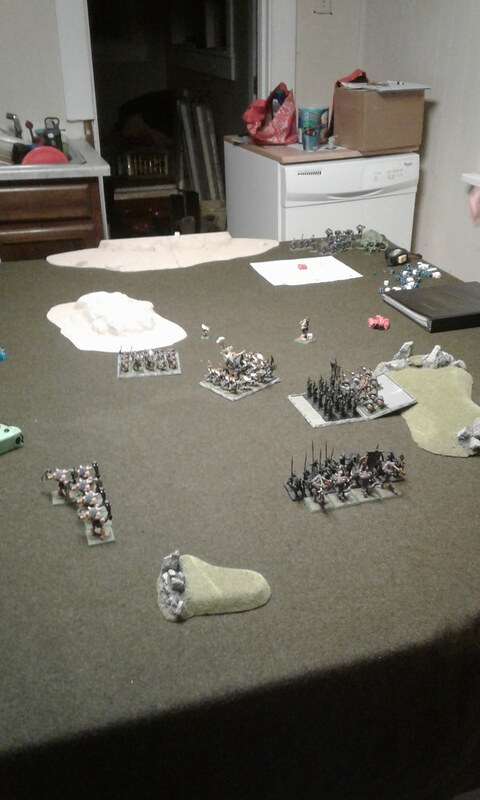 Movement sees no charges declared, and the Hand Weapon Saurus and Temple Guard units either reposition or reform to change facing against the 4 man Minotaur unit on my left side of the field. The shaman moves to the top of the hill. Magic phase sees the 4 Minotaurs take 2 wounds from Fireball, 4 wounds from Dark Hand, 2 wounds from Storm of Cronos, and Irresistible Force Urru's Dazzling Brilliance on the Bestigors. The Minotaurs pass Panic. In combat the Wargors both fail to do any wounds against the Spears, 1 wound is done to the BSB and one to a standard Bestigor, and 1 Spearmen is killed by a Bestigor. Drawn combat. The Herd does 2 wounds on the Kroxigors, and the Kroxies take the last wound off the Brayshaman. 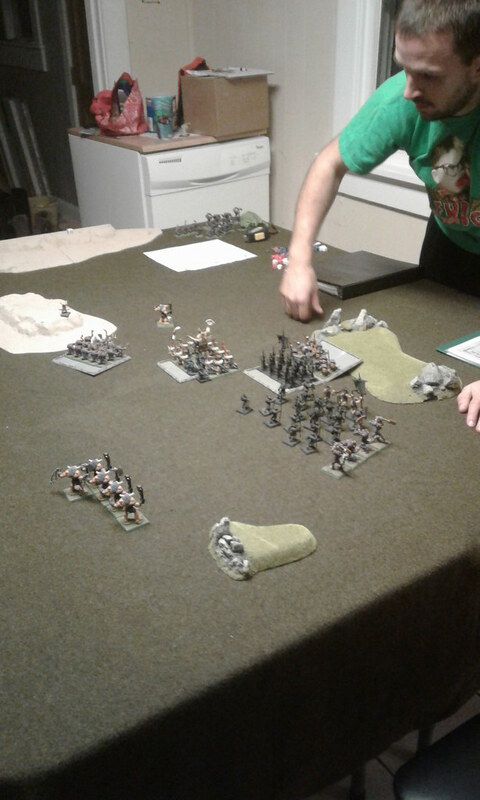 Losing combat, the Kroxigors break and flee "4 with the Herd pursuing 11"
The left Minotaurs charge the Hand weapon Saurus, the Herd fails its Fear test for charging the remaining Kroxigor unit, and the last Minotaur unit rallies. Magic phase has the Shaman place 2 dice into the Diadem. 1 Hand Weapon Saurus dies in combat, while they do 3 wounds back to the Minotaurs. The lone Minotaur breaks from combat 7" and the Saurus restrain pursuit. 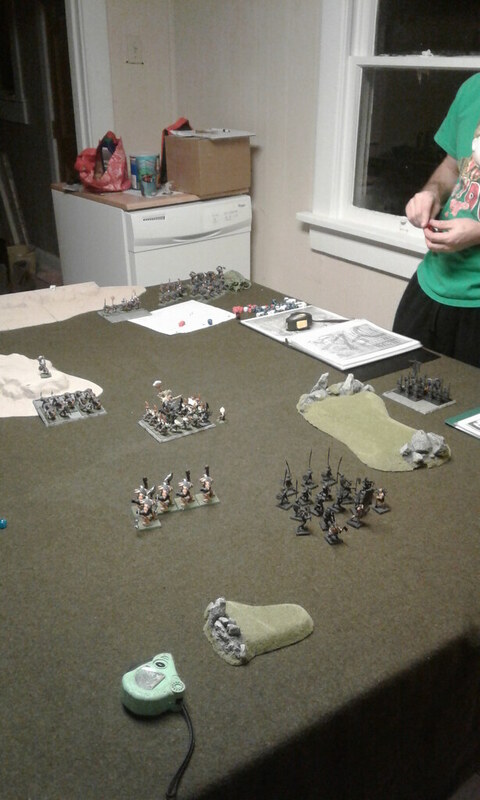 2 wounds on the Spearmen unit by the Wargors, 2 wounds on the BSB, killing him, and one Bestigor dies while the remaining Bestigors kill 3 Spearmen. The Spearmen make their Break test. 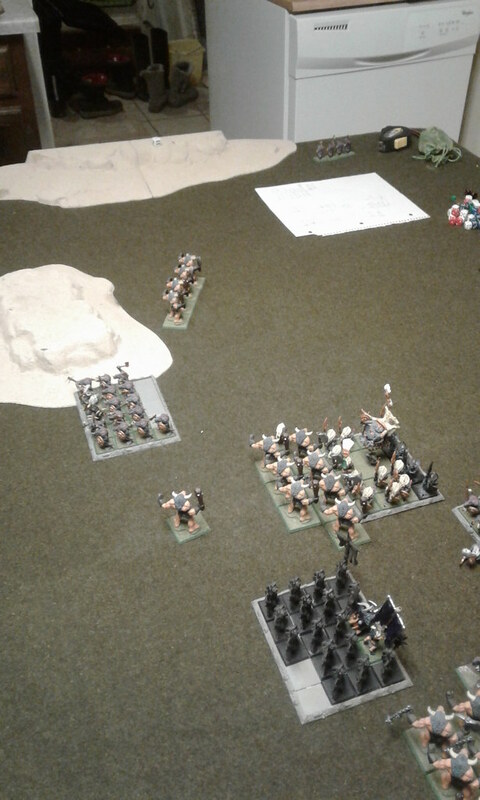 The Skink Shaman declares a charge on the Minos making them flee further, and the Kroxigors charge the Beast Herd. All others reform. 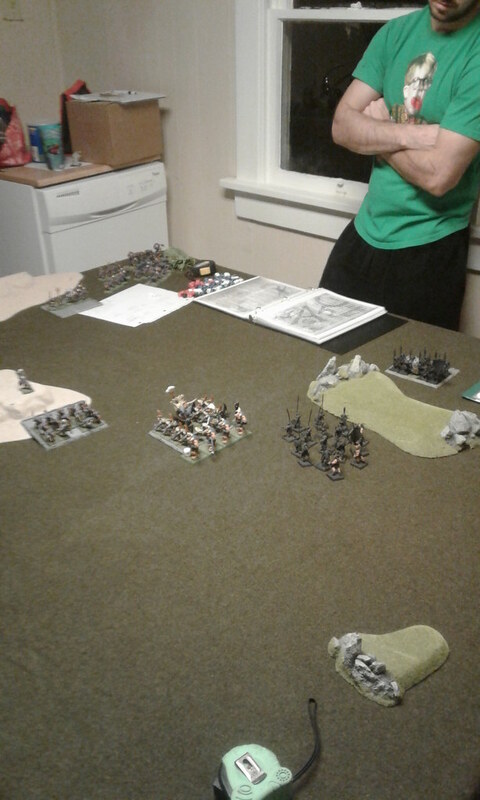 The Magic phase sees Irresistible Force on Storm of Cronos which does 3 wounds to the lone Minotaur, killing him. 2 Spear Saurus die to the Wargor, 2 Bestigors fall to the Spears, and the Bestigors pull down 3 more Spears. 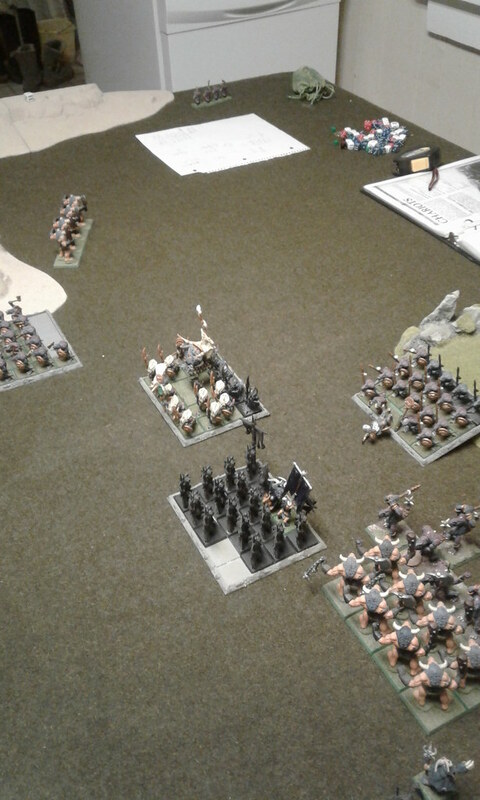 The Spear Saurus unit breaks and flees 11", with the Bestigors pursuing 7"
On the right side of the table, the Kroxigors pull down 2 Gors, with the unit doing 2 wounds back. The Kroxies break and flee 3". The Beast Herd, enraged at the loss of so many sacred Minotaurs, pursue 10". The Bestigors charge the Spearmen who fail to outrun them as they autofled. SUCCESS!!!!!!!!!!! The other units move closer to set up for charges. In the Magic phase the Shaman saves 2 dice in the Diadem of Power. Didn't see that coming. The Saurus and Temple Guard move to prep for charges, Skink Shaman just sort of stays in damage range, but out of charge range. Magic phase has 1 wound caused on the Minotaur unit from Fireball, 3 wounds from Dark Hand of Death, 2 Ungors to Storm of Cronos, and failure to cast Burning Head. The Minotaurs charge the Temple Guard, the Bestigors reform to face the battle, and the Herd moves max speed to close the distance. Magic phase - 2 in Diadem. In combat 3 Temple Guard are killed while 2 wounds are done to the Minotaurs. Combat resolution swings in the Temple Guard's favor and the Minotaurs break. Fleeing 7", the Temple Guard pursue 11", slamming into the Beast Herd. 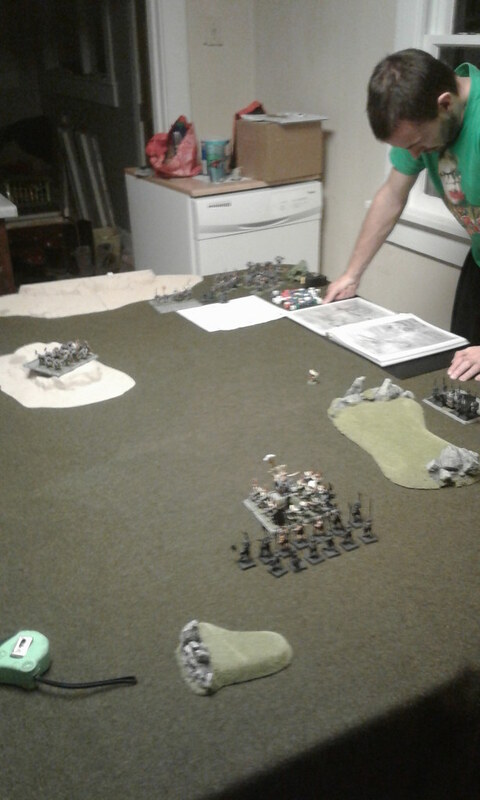 The Hand Weapon Sauruses move onto the hill at the far left of the field, and the Skink moves closer to the Bestigors. Storm of Cronos kills 3 Bestigors, Portent of Far gains 3 rerolls, and Urru's is cast on the Herd. 3 Gors are killed in combat, with no wounds in response. The Herd flees 8" as the Temple Guard pursues 7". The Herd rallies and the Bestigors can do nothing but move up further. And THAT was game, folks! What I had left was half of what he had, not counting any additional bonuses here or there. I learned a lesson about having magic defense, and I will be getting a second Brayshaman and a Beast Herd to tout him around with. Still a fun game, but I don't think I'll go magic light again, no matter how much he whined about the Tzeentch list. The best thing about juggling work and break and a family is the inability to sit and post one battle report in one sitting. For those keeping up with this so far, there were 6 turns and I will have them all soon. Thanks for the responses. March will be interesting as I have two 40K players in my unit who have never played 3rd edition but are interested in trying it out. 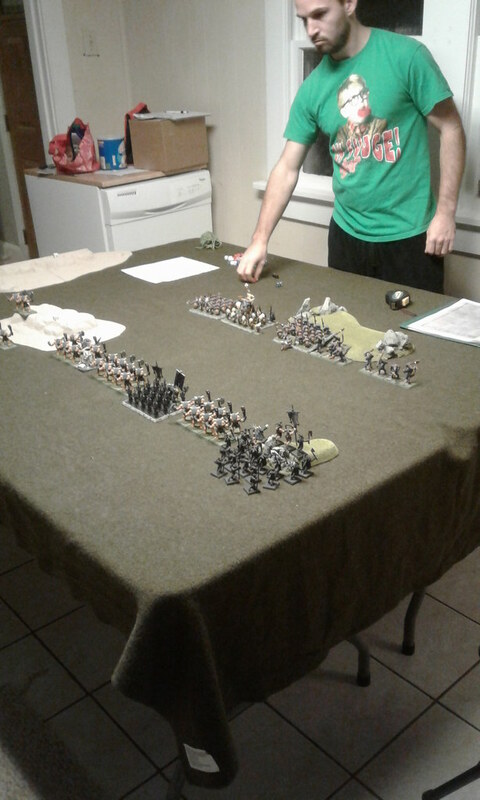 Great battle report so far. Out of curiosity, what kind of bestigors do you use? I have the old metals from the 6th edition, but have never picked up the plastic ones. I have, like, 62 of the old monopose plastic halberd Gors as my Bestigors since there are no weapon options for halberds on Gors unless you run the Ravening Hordes list. And since my army is themed around the 6th Ed. book, and would be illegal without a few tweaks, I'm stuck with them as Besties. Now if I could find a couple of the old Monkeyback Chaos Warriors' command arms and two of the axe arms where the axe is sort of above the model's head, then I'd whip up some more command and I'd be golden with it. Big bad update with Flickr upload to replace Ransombucket pics.